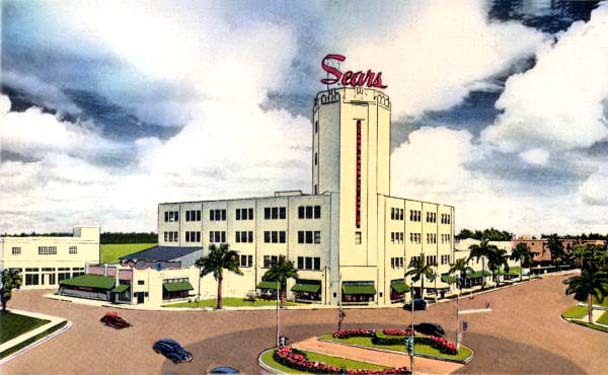 The state archives description: "The impressive department store of Sears, Roebuck & Co. in Miami as one of the outstanding Sears stores in the country. The plant with parking areas covers parts of two blocks. The front N. E. 13th to 14th Streets on Biscayne Blvd. 92,000 sq. ft. of selling space carries all lines of merchandise. The store is noted for its beauty and tropical atmosphere. While located in Miami, it is also easily accessible to Miami Beach." My father was the manager of this store in the late '50s through the middle '60s. A great time in Miami. I bought my first set of tires in 1956 for my 1946 Mercury convertible when I went to Miami Jackson High school. The building extension on the left was used in 1952 and 1953 to display the Allstate automobile that Sears was selling. It was a rebadged Henry J produced by Kaiser-Frazer in 1952 and Kaiser Willys in 1953. They also sold motor scooters from 1952-1967 that were produced by Piaggio (Vespa), Cushman, Puch and Gilera. That circle in the front used to be a "turn-around" for the trolley. Does anyone have any pictures of the trolley that went down Coral Way to the Gables?